Technological advances in the past decade have allowed every part of your office to become more streamlined, efficient, and productive. But are you getting the most out of this technology when it comes to your printers and copiers? With Konica Minolta’s bizhub INFO-Palette touchscreen, you will be ensured the most up-to-date technology for your office. What Makes the Bizhub Different? Essentially, all multi-function printers (and even most basic printers and scanners) on the market today have some form of touchscreen, but not all of them are very useful. Some take a lot of time to navigate through menus and aren’t very intuitively designed. Sometimes, they don’t even respond to your touch the first time, or the screen isn’t well-calibrated, leading to frustrating mistakes. This is where the bizhub INFO-Palette Touchscreen becomes a serious help for any office struggling with standard MFP touchscreens. Created only a few years ago, this screen is made to be as high-quality as the touchscreen on a smartphone or tablet. The 9-inch screen allows for easy viewing and reading and helps prevent accidentally touching a button you weren’t trying to hit. You don’t need to be a tech professional to understand and use this touchscreen; its intuitive design, ease of navigation, and helpful information/guidance will ensure that everyone in your office feels comfortable utilizing the bizhub INFO-Palette Touchscreen. The bizhub INFO-Palette is even more useful when you utilize bizhub’s array of applications available for their products in the bizhub MarketPlace. These apps, which allow you to connect to various e-mail apps, clouds, and much more, give your INFO-Palette Touchscreen even more flexibility and efficiency in the office environment. You can connect your computer and any other smart devices in ways that make information gathering and producing simpler than ever. Using the office MFP’s touchscreen shouldn’t be something that bogs down your document management. With the bizhub INFO-Palette Touchscreen, your office printing, copying, and so much more will become streamlined and more efficient, saving you time and money. If you are interested in improving your office’s printing and copying with the bizhub INFO-Palette Touchscreen, Caltronics Business Systems has your office solutions. This entry was posted in Uncategorized on November 30, 2015 by riehlt. Is Your Copier an IT Nightmare? For many offices, the copier is central to countless tasks, and having it run well is of the utmost importance for your office to work well. Sadly, copiers can also be a source of massive frustration and trouble, especially when they are highly utilized. Copiers can become a living nightmare for you, your coworkers, and the IT department (if you’re lucky enough to have one). But luckily, there is a solution to these issues: managed print services (MPS). Before discussing managed print services, let’s go more into what types of common copier issues can be resolved by MPS. One issue is getting stuck with outdated technology. If you buy a copier, whether it was new or used, and don’t have a contract associated with it, you could be trying to get the most out of it, ignoring the fact that it is outdated or isn’t being optimized with important parts and computer updates. This will lead to more frequent jams and breakdowns, causing a huge headache for everyone involved. Another problem that can affect your copier is having the wrong copier for your work environment. Again, if your office simply purchases one that they think looks good without any consultation, it might become a burden. If you have a small office that rarely has large print jobs, you shouldn’t waste money on the top-of-the-line copier that can print books. On the other hand, if your office is larger or often has high-volume printing, you shouldn’t try to save money by getting a cheaper copier that doesn’t fit your needs. This will end up costing you more in the end. One financial issue is the cost associated with toner and paper. If you aren’t optimizing your paper use, you could be wasting hundreds or even thousands of dollars each year when it could be avoided. With MPS from Caltronics, you will get reports and quarterly reviews which help to ensure that your usage is optimized and you aren’t wasting money when there’s no reason to do so. These costs can make a huge difference in the office’s bottom line. If you’re ready to improve the efficiency of your copier and your entire copying, printing, and scanning environment, Caltronics Business Systems can help. With top-rated service and reliability, Caltronics is one of the most trusted for Managed Print Services in California. This entry was posted in Uncategorized on November 23, 2015 by riehlt. 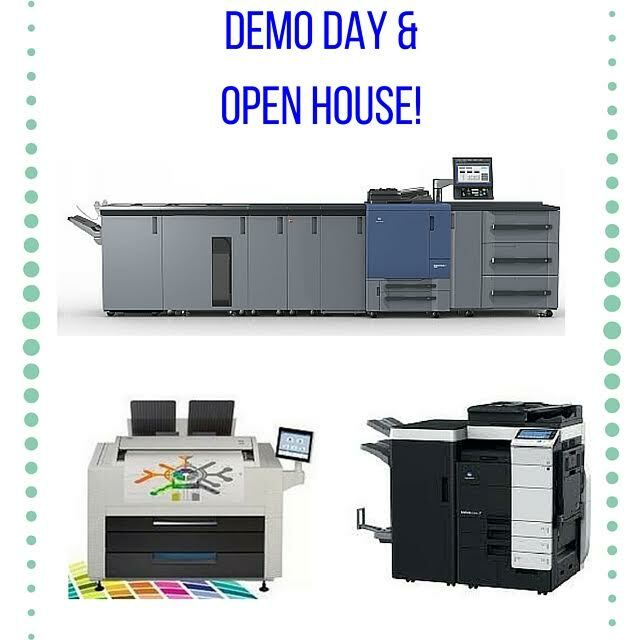 Join us for an Open House and Demo Day on December 10th! Are you in the Sacramento area? Come hang out with us on December 10th, 2015. Caltronics and Kelly Paper have teamed up to provide free print demos, networking, and lunch on December 10th from 10am-3pm. Check out on-site print demonstrations featuring the Konica Minolta C 1070, 1250 with Fiery Central, Bizhub C754e, NEW KIP 860 MFP and Production Scanners. RSVP at (916) 361-5374 for a chance to win our amazing door prizes! This entry was posted in Company Update on November 20, 2015 by riehlt. If you or your office has ever had to send a mass mailing out for any reason, you know how much of a lifesaver mail merging is. Allowing you to print the same document or letter with every address on a list, instead of having to manually create individual documents for each address, saves countless hours. But with variable data printing, you can take your mail merge capabilities to the next level. Variable data printing can benefit nearly any office, from marketing and customer relations to those in government and the medical field. And if you want a business that can get you started with variable data printing, learn more at Caltronics Business Systems. Variable data printing can do much more than what’s normally covered under the term “mail merge.” With mail merging, you can change the address/name fields in a document, but the other information remains the same from print to print. With variable data printing, you can personalize each document so much more. You can change more parts of text, and even images and secondary parts of the document, to make each print feel unique without needing to continually change it manually for each print; the printer can do all that work for you. Say, for instance, you work in a medical office, and you want to send all the patients reminders of their upcoming appointments. Obviously, you will have a variety of clientele, some families, some children, some adults with no children, some teenagers, etc. With variable data printing, you can not only maintain the same document template while adding the unique addresses, but also give some extra uniqueness to a letter going for a child’s appointment, some different text/images for a teenager, and even more different text and images for an adult. This type of personalization is extremely appreciated by customers and patients, and it will ensure that you have just a little more customer favorability than if you sent out the same letter to every client. Caltronics offers the hardware (like Konica Minolta bizhub multi-function printers), software, and knowledge that you need to take full advantage of what variable data printing has to offer. Go to www.caltronics.net to view their options. This entry was posted in Uncategorized and tagged Caltronics Business Systems, http://www.caltronics.net on November 18, 2015 by riehlt.